A bank's financial statements present a very different analytical problem than those statements belonging to a service or manufacturing company, and therefore to analyse the financial statements of a bank, there must be a distinct approach which recognises the unique risks of banking. A bank will take deposits from their savers while paying interest on many of the accounts. They then pass on the funds to borrowers, receiving interest on loans. A bank's profits are therefore obtained from the spread between the rate received from their borrowers and the rate paid out for funds, and the ability to combine these deposits from multiple sources and to lend out again to a range of borrowers allows the flow of funds which is key to the banking system. By being able to appropriately manage the flow of funds and managing corporate debt and liquidity, banks can generate a profit while acting as an intermediary of interest received and interest paid, and accepting the risk of offering credit. Banking is a business which is highly leveraged and which requires regulators to dictate a minimal level of capital to ensure each bank's solvency. Regulators have a strong focus on compliance, guidelines and restrictions that aim of uphold the integrity of the modern banking system. A bank will assume certain risks when undertaking this management of relationships: Interest Rate risk which involves managing the spread between the interest received on borrowers' loans and the interest paid out on deposits, and Credit Risk which is the chance of a borrower defaulting on their loan resulting in a loss of interest and capital. Interest Rate risk is mostly determined by the yield curve's shape, and any change in the market interest rate level can cause a change in the mix and volume of the bank's balance sheet. A bank generally assumes financial risk by offering loans at an interest rate that is different from the amount paid out on deposits, with deposits having a shorter maturity than a loan and a faster adjustment to the market rate. This mismatch is key to creating a positive net interest revenue. Should the yield curve begin to flatten, a bank can reduce the impact by increasing the amount of fees they charge their customers for providing services. 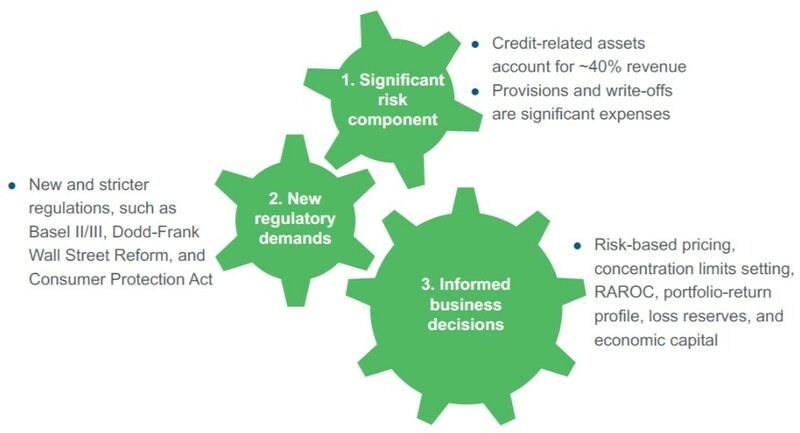 Credit Risk can best be defined as the chances of a borrower failing to meet their obligation in accordance with the terms and conditions agreed at the time of taking out a loan. If this should happen, the bank experiences the loss of a portion of, or even the entirety of the credit supplied to their customer, so in order to absorb this kind of loss, the bank will maintain an allowance for these loan losses. Of course, it is for this reason that banks pay close attention to counterparty risk profiles before offering a loan to a customer, and any negative credit rating may result in a curtailment of lending activities to the potential borrower, however even when a customer passes a credit check defaulting on loans still does occur and therefore a bank must maintain a pool of capital which has been set aside specifically to absorb potential loan losses. To provide adequate provision for this eventuality requires the bank to use a considerable amount of judgement, ensuring that the amount set aside is always greater than the actual losses that will be incurred. Any bank that only has a pool large enough to cover their actual losses will not be reserving enough capital to cover their future losses and will therefore result in a loss of income for the financial institution and potential action from regulators. How Can a Bank's Corporate Debt Management Profile Help Investors? By reviewing a bank's financial statements, an investor can identify the major factors which must be borne in mind when making an investment decision. An investor must develop a strong understanding of the yield curve and business cycle which both have an impact upon a bank's economic performance. The key factors to consider are the credit risk and interest rate risk as the bank's performance follows its yield curve. Should it become inverted or flattened, the net interest revenue of the bank will be under more pressure, while it will improve when the curve goes back to its more traditional shape. The biggest contributor to a bank's poor financial performance is credit risk, which can even result in a bank losing money.